When it’s 40+ degrees outside, we need a way to cool down fast! See Phoebe’s skypool photos! Phoebe seems to be having a good time playing in the pool. 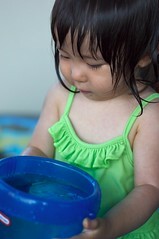 She is so occupied with the cool water huh? You are so cute!! !